Spread the Word to End the Word is an ongoing effort to raise the consciousness of society about the dehumanizing and hurtful effects of the word “retard(ed)” and encourage people to pledge to stop using the R-word. The campaign, created by youth, is intended to engage schools, organizations, and communities to rally and pledge their support to promote the inclusion and acceptance of people with intellectual disabilities. 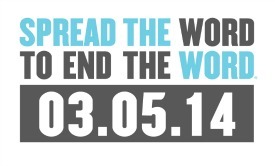 When: The official Spread the Word to End the Word Day is the first Wednesday in March. This year the day falls on March 5th, 2014. Year-round, people everywhere can help spread the word throughout their communities and schools by having pledge drives, youth rallies, and online activation. Why: The campaign asks people to pledge to stop saying the R-word as a starting point toward creating more accepting attitudes and communities for all people. Often unwittingly, the word is used to denote behavior that is clumsy, hapless, or even hopeless. Whether intentional or not, the word conjures up a painful stereotype of people with intellectual and developmental disabilities and it hurts, even if you don’t mean it that way. Language affects attitudes and attitudes affect actions. ACT NOW! Take the pledge today to show your support in eliminating the R-word! You can also promote inclusion in your school by hosting a Spread the Word event. Click here for more info.